Has anyone else tried Pow Pizza in Renfrew? 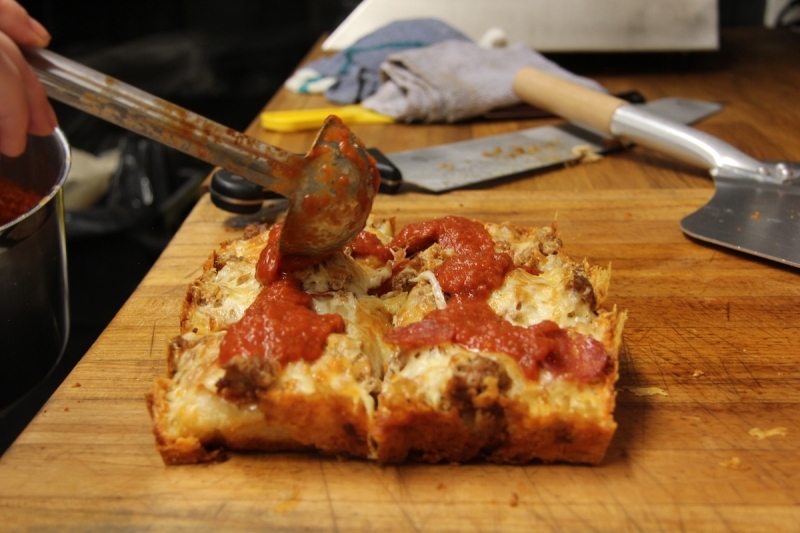 It's the same people as Without Papers but this location makes Detroit style pizza. It's kinda like Little Caesar's deep dish, but this is obviously much, much better. I got the classic pepperoni. They use wagyu beef to make the pepperoni, which is delicious, but I'm not sure if that's overkill or not. The crust is crispy and buttery, and they don't skimp on the cheese. After the pizza comes out of the oven they pour tomato sauce over it, which is a nice touch. The prices are high, but that's probably because of the premium ingredients. I'll still be back though. I want to try the Aloo Gobi next. Had POW a few weekends back and it was unreal. Would recommend. It’s just around the corner from me. Got the pepperoni I and tried to get the Coney Island, but ended up with perogie. It’s good, but the pepperoni was too spicy for my daughter. A small will definitely serve 1 person. Who are the people in charge of this product and why haven't they been fired? Nice! I first tried Detroit-style pizza in NY of all places, but it was awesome. Will definitely have to give this a shot, especially since its so close by. The fact that it's not another Neapolitan place is a real bonus. It's just around the corner from me as well. I find it to be overpriced for what it is. It's only game. Why you heff to be mad? I’m on radford, where are you? Doesn't that just apply to the general food scene in Calgary? The wife and I usually get pizza on Friday nights, that's been our thing for a while now. So was very happy to have a gourmet pizza joint in the neighborhood. We will keep it in the rotation, but I don't feel that it warrants the hype. The price per pie is similar to without papers, but I find that style of pizza to be more flavourful and generally a better value. This DSP is very doughy (as is typical of the style) and we find that the toppings get lost in all that bread. I tend to stick to the special POW creations when they pique my interest. My wife and I went to POW today because of this thread! We both really liked the pizza. I had the Italian Street Meat and she tried the Haute Renfrew. I found that mine had just enough 'zip' in it for my taste. Hers seemed a touch bland to me, I'd have put some seasoning of some kind (possibly even just black pepper) on it. She intends to add hot sauce when she eats the leftovers. I loved the crispy crust. The pizzas take about 25-30 to prep, so call ahead. The interior seating is 3 barstools (total, yes). The exterior seating is a single picnic table. This is likely better off 'order in/pick up' than it is 'eat in'. Good eating, to be sure. But next time we'll be ordering ahead and picking up to take home.